Chelsea has undergone an amazing change over the past 15 years. I should know, I've lived there nearly all of my 29. Areas like the meatpacking district and the twenties west of 10th avenue have been renovated to the point where I can't remember what they once looked like. The makeover is so complete, their old face is only a fog in my mind. One small strip along 9th avenue between 17th and 19th streets has for a long time resisted this tidying up, and I would chance to say it is because of its proximity to the city projects that run along its length. It is only recently that the stores along this 2 block stretch have begun to undergo makeovers themselves. I am going to assume that for a long time the neighborhood clientele was enough to keep these businesses afloat and resist the change that was happening all around them. 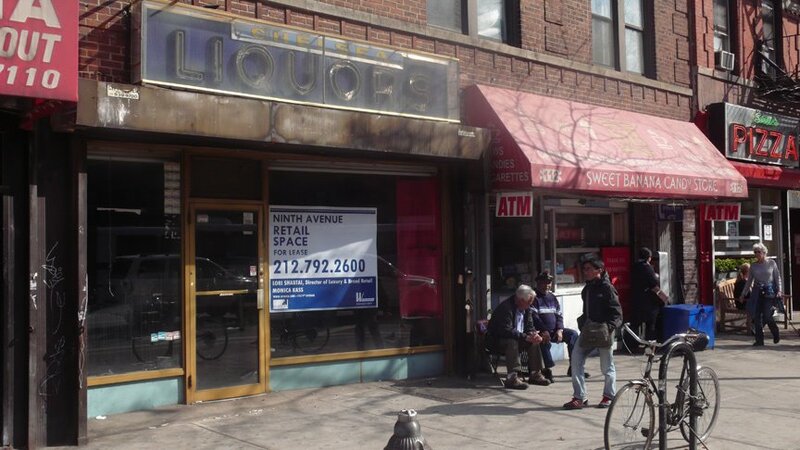 It has only been a few months since the liquor store (pictured below) has been closed, and the deli on the corner we are talking about closed even more recently. I must say I miss the old Korean liquor store owner, endlessly complaining while spewing religious knowledge like he was standing at the pulpit. He was a great guy. I refuse to get into any debate about outdoor advertising and its relationship to income here, that's not what I'm after. Just down the street beyond the projects and adjacent to the Chelsea Market, there is a glut of advertising in the form of billboards that rivals any major thoroughfare. The fact is, along with the makeover of Chelsea, came billboards and bulletins aplenty as more and more sets of eyes began to populate the streets. 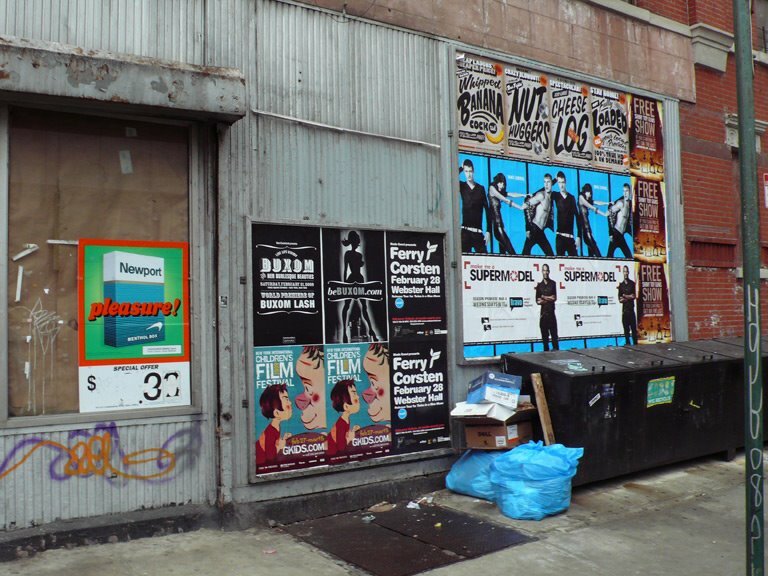 What I am interested in here is why this particular NPA City Outdoor advertising location came down, and what that says about the permanence, or lack thereof, of every other outdoor advertisement in the city. 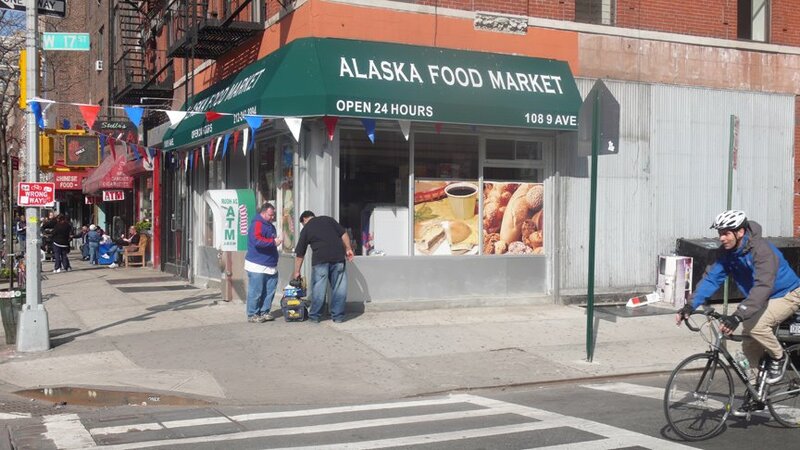 I think what is clear in these photos is that this corner, the deli, and the landlord included, have made an attempt to beautify and raise the aesthetic value of this location. In doing so they were faced with the large garish advertisement that adorned the side of the building which they were trying to improve. Realizing it was incongruous with the vision they had for this space, they removed it. And that is all I'm concerned with. The fact of the matter is, when faced with the improvement of both the aesthetic value of this location as well as the capitol value of this location, advertising was seen to be an eyesore. So are there any places where advertising is not an eyesore and more integral to the space it is occupying, or sharing, depending on your view? Of course Times Square is the default location, but not many more come to mind. In the subways, advertising is expected but is in no way an integral part of the space. In fact advertising is in conflict with the real purpose of most public spaces in the city, detracting from their aesthetic character and bastardizing whatever real purpose they intend to serve. It is for this exact reason that we don't allow advertising in public parks. Advertising in our public spaces sets the agenda for those spaces as being first and foremost, commercially oriented. And yet this simple example shows just how very easy it is for a landlord to remove the blight from their property and increase both the public visual landscape, and I would also argue, the public mental landscape. It is our responsibility as socially minded individuals to see through what seems to be inevitable and find alternate visions of our community and city at large. Did you confirm your theory with the building's owner? I suspect that the case may have been that the company (NPA) may no longer wish to pay for this location. They have allowed leases all over the city to roll over without renewal in the last few months. BIS gives no information regarding these ads as they do not go through the system because the company fails to obtain permits from the DOB. In regards to wildposting construction sites, that is illegal and punishable by law. I suggest you stop implicating our enemy on our site, though they do a good job of it on their own website.